Animals, just like ourselves, can also suffer from muscular-skeletal problems which can give rise to pain, impede their performance and effect their quality of life in general. Issues can arise for various reasons such as falls, trips and injuries, or could be stiffness from new or increased work. It could be that they are suffering from arthritic changes in their joints, or need help after a surgical procedure. Whatever the cause, they can greatly benefit from osteopathic treatment and manipulation. The aim of Osteopathy is to find and treat the cause of any dysfunction rather than treating the symptoms, so as to restore correct function. Performance will be improved by encouraging optimal muscular and joint function, and so it is easier to maintain good health and reduce future injuries by finding and fixing any issues before they become a problem. Under current Veterinary Law only a Veterinary Surgeon can provide a diagnosis and treat an animal. However vets are increasingly referring cases to osteopaths where appropriate, but it is important to remember that it is an offence for any person to treat and animal without first seeking veterinary approval. To this end, prior to any treatment being undertaken, I would contact your vet to gain their approval for treatment to take place. Osteopathy, or any other form of treatment is no substitute for veterinary care, and whilst it is possible to drastically reduce the reliance on prescribed medication, the animal should always remain under the primary care of their vet. In order to work with animals an Osteopath has to complete a year’s post-graduate training at an accredited centre. I trained under prominent Equine Osteopath Stuart McGregor at the Osteopathic Centre for Animals in Wantage and achieved a post-graduate diploma in Animal Osteopathy. The training covered key aspects of Equine and Canine anatomy, biomechanics, pathology and equitation. Specific focus was given to the safe and effective application of the principles of Osteopathy and its techniques to both horses and dogs, which meant we spent a lot of time in stables and kennels gaining invaluable hands-on practical experience. It is also a legal requirement that an Animal Osteopath be fully insured. Please feel free to check with Balens.co.uk if you have any concerns. Price may vary depending on distance travelled, and the number of animals treated in that location. Sessions will last between 30-60 mins per animal. Most insurance companies are happy for an animal insured with them to receive osteopathic treatment from a registered osteopath holding valid insurance, provided that the vet both recommends the treatment and refers the case. It’s always best to check with the insurance company and Vet prior to treatment. Each animal treated will be considered as an individual, and as such treatments will be tailored specifically to it. The number of treatments required will depend upon the animal's history, the initial complaint and its cause, and how the horse or dog responds to the treatment. It will also depend upon the level of work the animal is required to do. Usually most problems are sorted out within 4 treatments. On-going osteopathic assessment and treatment is an effective way of avoiding potential injuries. Animals in work should be checked at least 4 times per year, with additional consideration being given to pre-competition treatments and preventative treatments. Older dogs will often require more regular maintenance treatments to help keep any pain under control and to retain their mobility. Every animal will respond differently to the treatment. 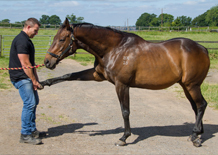 Treatments are generally very gentle and will include joint articulation, soft-tissue techniques and stretching, trigger point work and joint manipulation. The horse/dog will often relax well throughout the treatment and enjoy it immensely, but as treatment causes a healing response to occur in the body, this can often be quite a tiring experience. It is therefore important to allow a period of time after the treatment for the animal to relax. In general animals will appear more relaxed and mobile following treatments, but this can lead to slight stiffness for the next 24-48 hrs. As such it is not recommended that your horse or dog be worked for the 2-3 days following a treatment. Instead, horses should be turned out and allowed to relax in the field with plenty of fresh water available, and dogs should have very gentle lead exercise and short walks with no jumping or chasing balls. Rehabilitation and management of conditions such as hip dysplasia, arthritis, cruciate ligament damage, disc problems, post surgery.